A Category One Caesarean Section Process at an Australian Tertiary Obstetric Hospital: Planning to Reduce Decision to Delivery Time. Smith, M., et al. A Category One Caesarean Section Process at an Australian Tertiary Obstetric Hospital: Planning to Reduce Decision to Delivery Time (2014) J Anesth Surg 1(1): 15-19. © 2014 Smith M. This is an Open access article distributed under the terms of Creative Commons Attribution 4.0 International License. Objective: To standardise emergency response processes to life threatening maternal and fetal situations requiring activation of a category one Caesarean section (C1CS), with the aim of reducing decision to incision (D-I) and decision to delivery (D-D) times. Design: A prospective observational study following the introduction of a streamlined C1CS process. Population: All women who had a C1CS process activated over a 14 month period. Methods: Data were collected prospectively on a newly developed C1CSResponse Management Plan with documentation of D-I and D-D times for multiple variables. Main outcome measures: D-I and D-D times. Results: The median D-I was 11 minutes (interquartile range (IR): 7 minutes). 83% (68/82) of calls which proceeded to C1CS had D-I within 15 minutes. The median D-D was 17 minutes (IR: 9 minutes). 76% (62/82) of calls, which proceeded to C1CS, had D-D within 20 minutes and 96% within 30 minutes. Factors which significantly decreased D-I and D-D (p < 0.05) included: taking verbal rather than written consent, not performing bladder catheterisation, not performing pubic clipping, and not changing women into theatre attire. Seniority of the surgeon did not affect times. Conclusions: A streamlined C1CS process can achieve D-I and D-D times well within expected international standards. A category one Caesarean section is initiated when there is imminent threat to the life of the woman or the fetus. The Royal Australian and New Zealand College of Obstetricians and Gynaecologists college statement states: "The decision to delivery interval of 30 minutes, decreed as necessary in many legal judgments seems based on custom and practice, rather than on objective evidence in relation to condition of the newborn". RANZCOG endorses a 4 grade classification system, with no specific time requirements associated with each. There is a paucity of published data from Australian hospitals on decision to delivery (D-D) times for Category 1 caesarean sections. One study, in South Australian maternity hospitals with differing levels of capability, reported median D-D intervals (10-90th percentile) 69(37-114), 54(28-94), and 42(17-86) minutes in level one, level two and tertiary maternity hospitals respectively. Prior to the introduction of the C1CS process there was no standardised process to respond to life threatening maternal and fetal emergencies in our hospital, and thus there was potential for variation in response times and actions among staff involved. A pre-project audit of emergency Caesarean sections showed a large variation in the time taken from decision to delivery ranging from 14 to 140 minutes, with those that would meet the criteria for Category 1 ranging from 14 to 98 minutes. We identified delays in notifying and organising core team members as well as identifying a number of potentially unnecessary processes previously associated with emergency caesarean section. The aim of this process was to streamline these. This study was conducted according to the Note for Guidance on Good Clinical Practice (CPMP/ICH/135/95) and in compliance with applicable laws and regulations of the state and country in which it took place. The study was being performed in accordance with the National Health and Medical Research Council Statement on Ethical Conduct in Research Involving Humans (©Commonwealth of Australia 2007) and the principles laid down by the World Medical Assembly in the Declaration of Helsinki 2008. Ethics approval was not gained from the Royal Brisbane and Women's Hospital human research ethics committee (RBWH HREC). Neither written nor was verbal consent obtained. The RBWH HREC exempted the study from obtaining patient consent for collecting the information due to the emergent timing of the caesarean section and the fact that the information was collected after the event in keeping with normal clinical documentation procedures. The data for the study was then mined from this database as a clinical audit. The Director of Obstetrics (first author) obtained funding for this project from the Queensland Government and oversaw the project and subsequent implementation of the C1CS process at the hospital, as well incorporating this into core business mechanisms of the facility. A multidisciplinary group was convened to provide governance and clinical guidance to a project officer. The RANZCOG categories of Caesarean section were agreed upon, and clinical conditions determined that defined the C1CS criteria (Figure 1). All women received prophylactic antibiotics intra-operatively according to departmental protocol. Once the procedure is completed the women is then transferred from recovery to the postnatal ward, the birth suite for close surveillance, high dependency unit (HDU) or intensive care unit (ICU) depending on clinical status. This was used as an indirect outcome measure of immediate maternal condition. Factors which potentially influence D-I and D-D times included: written consent, bladder catheterisation, pubic clipping, intravenous cannulation, patient changing into theatre attire and ringing the emergency bell in birth suite. Other factors studied included the criteria used to activate the C1CS (Table 1), the seniority of the surgeon and the time of day of the procedure. Cat 1 CS activation followed criteria? Data were collected for the 92 cases of C1CS activated over the period April 2008 to May 2009 and analysed using the SPSS software package. One way analysis of variance was used to test for differences in D-I and D-D times. Categorical variables were analysed in contingency tables and Fisher's Exact Test used to determine significance. There were approximately 4,700 deliveries during the project and follow up period at this tertiary facility. The overall Caesarean section rate was 32%, with 66% of these being emergency Caesarean sections. 92 C1CS calls were activated during the study period. Of these, 82 proceeded as called, six were downgraded to category 2, and 4 were delivered vaginally after the C1CS call. 13 calls did not meet the criteria but proceeded to Cat 1 CS (Figure 2). For the 92 cases activated as a C1CS the mean D-I (or start of vaginal delivery) was 13.1 minutes (95% CI 11.4-14.9, range 2-53). The median D-I (or start of vaginal delivery) was 11 minutes (interquartile range (IR) 7). 82 of the 92 C1CS activations proceeded without change. 83% (68/82) of those which proceeded to C1CS had a D-I within 15 minutes (range 2-42). Mean D-D interval for all 92 C1CS activations was 18.5 minutes (95% CI 16.6-20.4, range 6-66). The median D-D was 17 minutes (IR 9). Of the 82 women who proceeded to a C1CS, 76% (62/82) had a D-D within 20 minutes and 96.3% (79/82) had a D-D of less than 30 minutes (range 6-48 mins). The mean and median D-D for these 82 cases was 17.5 minutes and 16 minutes respectively (IR 13-20, SD 7.2). Factors which potentially influence D-I and D-D times are summarised in (Table 2). The clinical criterion for activating the C1CS made no significant difference to D-I or D-D intervals, nor did ringing the emergency bell before activating the C1CS or Maternal resuscitation (recorded for 79 cases). Maternal resuscitation was specified in the C1CS process to be done as clinically required. Made significant difference in time if not performed? Not taking written consent decreased D-I and D-D times significantly. 86% of verbally consented patients had a D-I time within 15 minutes compared to 60% in the written consent group (p = 0.02). 79% of verbally consented patients had a D-D time of less than 20 minutes compared to 50% in the written consent group (p = 0.02). The C1CS process required the obtaining of verbal consent which was to be documented postoperatively. Bladder catheterisation prior to procedure increased D-I and D-D times significantly. 90% of uncatheterised patients had a D-I time within 15 minutes compared to 69% of patients with a catheter (p = 0.02). 82% of uncatheterised patients had a D-D time of less than 20 minutes compared to 57% of catheterised patients (p = 0.03). Bladder catheterisation was not specified in the C1CS process. There were no instances of bladder trauma in the study population. Pubic clipping prior to the C1CS similarly, significantly, increased D-I and D-D times. 87% of unclipped patients had a D-I time within 15 minutes compared to 53% of patients who were clipped (p = 0.007). 78% of unclipped patients had a D-D time of less than 20 minutes compared to 47% of clipped patients (p = 0.02). Pubic clip was not specified on the C1CS process. There were no wound infections or dehiscence noted in the study population. Changing women into theatre attire significantly increased both D-I and D-D times. 90% of unchanged patients had a D-I time within 15 minutes compared to 63% of patients who changed attire (p = 0.01). 81% of unchanged patients had a D-D time of less than 20 minutes compared to 54% of changed patients (p = 0.03). Changing into theatre attire was left to clinical judgement and not specified in the C1CS process. There was a significant reduction to D-I and D-D times when general anaesthetic (GA) was used compared to regional anaesthetic (RA). Women who had a D-I time of less than 15 minutes included 86% of the GA group compared to 64% of the RA group (p = 0.04). Women who had a D-D time of less than 20 minutes included 79% of the GA group compared to 48% of the RA group (p = 0.008). The type of anaesthesia was determined by the anaesthetic team. Three Cat 1 CS had D-D times beyond 30 minutes, all three having had failed regional anaesthetic needing to be converted to a general anaesthetic. Achieving a D-I or D-D interval of less than 15 and 20 minutes respectively, regardless of all other variables, made no significant difference to where the women were transferred post-operatively. Of the 82 women who had a C1CS and the six downgraded to a category 2, a total of 74 went to the ward, 11 went to birth suite, 3 went to ICU. Of those that went to ICU, one patient was already in ICU for maternal pneumonia with hypoxia, leading to fetal hypoxia requiring a Cat 1 CS. The second was already in ICU following a motor vehicle accident at 36 weeks gestation. Fetal distress was noted in ICU, and in the process of getting to theatre she collapsed, changing the category from 2 to 1. The third patient was a transfer from a homebirth situation with chorioamnionitis and generalised sepsis requiring C1CS and subsequent ICU care. Of the 62 of 88 women who had a Category 1 or 2 caesarean section D-D within 20 minutes, two had classical Caesarean sections due to extreme prematurity, and the other 60 had lower segment Caesarean sections (LSCS). The additional 23 women who were delivered by Caesarean section by 30 minutes also had LSCS. There were 93 babies from the 92 C1CS activations. 32 babies were admitted to the ICN, and 19 to SCN. APGAR scores at one minute were: 0-3 – 21%, 4-6 – 18%, 7-10 -61% and five minutes were: 0-3 - 4%, 4-6 - 11% and 7-10 - 85%. 11 babies were less than 30 weeks gestational age, nine were of 30- 36 weeks, and the remaining 73 were 37 weeks or more. Of the term group, 12 were admitted to ICN, five required assisted ventilation, and two continuous positive airway pressure ventilation. 2 of the 5 requiring assisted ventilation had significant hypoxic ischaemic encephalitis (HIE) and received therapeutic hypothermia. The other three babies were ventilated for: cardiorespiratory depression without HIE (n = 2) and congenital abnormality (n = 1). Overall 2 babies died, at 24 and 25 weeks gestational age. The mean time spent in ICN was 19.2 days and SCN 12.6 days. For babies of 37 weeks or greater gestational age who were admitted to the neonatal nursery, the mean time spent in ICN was 2.4 days, and SCN 3.5 days. D-I and D-D times for C1CS are influenced by a multitude of factors much of which remains unexplained. Indeed determination of what constitutes a C1CS is based largely on clinical judgement. A four-category urgency classification system based on clinical definitions was introduced in 2000 with clinical application remaining inconsistent. Attempts at assessment of a modified four-category classification of urgency of Caesarean section based on the original classification system did not improve consistency of clinical application and warned against adoption. It is not surprising then that colleges of obstetricians and gynaecologists around the world have different approaches to this contentious clinical and medico-legal area, albeit an important one. The joint statement of the Royal College of Obstetricians and Gynaecologists and The Royal College of Anaesthetists recommends adoption of the Lucas classification of urgency of Caesarean sections, emphasising that urgency remains within a continuum of risk. They also recommend clear channels of communication and local drills particularly for C1CS. The 30 minute D-D interval for emergency Caesarean section is widely recommended and accepted by healthcare policy makers and service providers[7-9]. Published data from the United Kingdom suggests D-D times within 30 minutes in emergency Caesarean sections ranging from fewer than 40% to 71 %[10,11]. These reports however did not differentiate between categories of emergency Caesarean sections, making it difficult to determine D-D times for C1CS. Only 46% of Category 1 and 16 % of Category 2 CS were delivered within 30 minutes in the United Kingdom National Sentinel Caesarean Section Audit. Lim et al have shown impressive mean D-D times of 7.7 minutes after implementation of a "crash" CS protocol. Kwek et al. from the same institution have reported 80% of D-D achieved within 20 minutes in a "crash" situation. Their institution has a dedicated fully staffed operating theatre for "crash" Caesarean sections with average annual delivery numbers around 15,000. Several studies have identified delay in transfer to theatre as the main factor associated with prolonged D-D intervals in emergency Caesarean births[15-19]. Having adequate numbers of midwifery staff is also crucial. A UK study showed that the ratio of labouring women to midwives had a significant effect on the D-D intervals, which were significantly prolonged when 1:1 care was not provided. In our hospital when a C1CS is called, a ratio of at least 1:1 is established by ringing the emergency bell in birth suites. Our study aimed, in the first instance, to set up a co-ordinated communication system, define roles of core staff required to affect a C1CS efficiently and to standardise clinical criteria and documentation. D-D times for those Caesarean sections fitting clinical criteria for a C1CS are well within the 30 minute standard arbitrarily prescribed internationally (96.3% of women had a D-D of less than 30 minutes, median:16 minutes). Indeed a large majority of deliveries (76%) were achievable within 20 minutes. Results also show that certain traditional processes entrenched in practice such as written consent at the time of a dire emergency, bladder catheterisation, pubic clip and changing women into theatre attire may be causing unnecessary delay in a life threatening situation. The factors which were shown to significantly reduce D-I and D-D times require further discussion. Obtaining written consent in a C1CS situation is unnecessary as the urgency is dictated by a threat to the life of the mother and or baby. Verbal consent should be taken (if possible) and documented when convenient. Pubic clipping has been traditional practice prior to performing a Caesarean section; however this is not supported by evidence. There is some non-obstetric data that suggests that not clipping or shaving leads to less wound infections. Pubic clipping was left to clinician preference and not specified in the C1CS process. The majority of women (68/92) were not clipped. There were no wound infections or dehiscence's noted in the study population, suggesting that it is a safe practice to omit clipping in this situation. In our study both the D-I and D-D times were reduced when clipping was omitted. Further studies are required in this area. Bladder catheterisation was left to clinical judgement and not specified in the C1CS process. The majority of the women (n = 49) were not catheterised. Omission of bladder catheterisation was associated with shorter D-I and D-D times. There were no instances of bladder trauma in the study population. A recent systematic review of bladder catheterisation for Caesarean sections suggests that not catheterising is associated with less urinary tract infections and no increase in intra-operative difficulties. Changing into theatre attire was left to clinical judgement and not specified in the C1CS process. The majority of the women were not changed into theatre attire (57/92). Not being changed into theatre attire was associated with significantly reduced times to D-I and D-D. The type of anaesthesia was determined by the anaesthetic team. The majority of women (72%) had a general anaesthetic. In a survey of British consultant led maternity units a median general anaesthetic rate of 51% was reported for Cat 1 CS (range 6-100%). In our study having a general anaesthetic was associated with significantly shorter D-I and D-D times. These data are consistent with recent studies reporting that GAs are associated with shortened D-D intervals[19,23,24]. In our study three Cat 1 CS had D-D times beyond 30 minutes, all three having had failed regional anaesthetic needing to be converted to a general anaesthetic. Recent data from a series of 25 cases in the UK on rapid sequence spinal anaesthesia on selected cases for Cat 1 CS has shown a mean D-D interval of 23 minutes. This study was limited by the lack of randomisation and the relatively small study population. Larger studies are required to support this study's findings. Obtaining informed consent for randomisation in life threatening situations would require a waiver of informed consent from the human research ethics committee. Neonatal outcomes were not further analysed due to the small numbers and the multiplicity of confounding variables. Having a simultaneous paging system to mobilise the core team, and defining specific roles of each of these members is critical to achieving efficiency and reducing D-I and D-D intervals. It is important to note that reduction of D-D interval requires effective team-work, and attention to processes occurring before and after the establishment of anaesthesia. In our hospital we have established a streamlined C1CS process with a co-ordinated communication system, predefined roles for core staff and standardisation of clinical criteria and documentation which has achieved D-I and D-D times well within expected international standards. 1. College Statement. Royal Australian and New Zealand College of Obstetricians and Gynaecologists. Categorisation of urgency for Caesarean section. 2. Resources for Women. College of Obstetricians & Gynaecologists' 2009 Scientific Meeting in Conjunction with the XX1st Asian & Oceanic Congress of Obstetrics & Gynaecology. (2009) Auckland, New Zealand. 3. Spencer, M.K., MacLennan, A.H. How long does it take to deliver a baby by emergency Caesarean section? (2001) Aust NZ J Obstet Gynaecol 41(1): 7- 11. 4. Lucas, D.N., Yentis, S.M., Kinsella, S.M., et al. Urgency of Caesarean section: a new classification. (2000) J R Soc Med 93(7): 346- 350. 5. Kinsella, S.M., Scrutton, M.J. Urgency of Caesarean section: do obstetricians and anaesthetists agree? (2003) Inter J Obstet Anesthesia 12: 231. 6. Kinsella, S.M., Scrutton, M.J. Assessment of a modified four-category classification of urgency of Caesarean section. (2009) J Obstet Gynaecol 29(2): 110- 113. 7. Royal College of Obstetricians and Gynaecologists and the Royal College of Anaesthetists. Classification of urgency of Caesarean section– A continuum of risk. (2010) Good Practice No.11. 8. Care during labour and delivery. Confidential Enquiry into Stillbirths and Deaths in Infancy: 4th Annual Report, 1 January–31 December 1995. (1997) London: Maternal and Child Health Research Consortium p35. 9. Clinical Negligence Scheme for Trusts, Clinical risk management standards, Criterion 12; 3; 1, Clinical Negligence Scheme for Trusts, (1999) London, UK. 10. 7th Annual Report: Confidential Enquiry into Stillbirths and Deaths in Infancy. (2000) Maternal and Child Health Research Consortium pp 41-52. 11. Mackenzie, I.Z., Cooke, I. What is a reasonable time from decision to delivery by Caesarean section? Evidence from 415 deliveries. (2002) BJOG 109(5): 498- 504. 12. Helmy, W.H., Jolaoso, A.S., Ifaturoti, O.O., et al. The decision to delivery interval for emergency Caesarean section: is 30 minutes a realistic target? (2002) BJOG 109(5): 505- 508. 13. Thomas, J., Paranjothy, S. Royal College of Obstetricians and Gynaecologists Clinical Effectiveness Support Unit. National Sentinel Caesarean Section Audit Report. (2001) RCOG Press London. 14. Lim, Y., Shah, M.K., Tan, H.M. Evaluation of surgical and anaesthesia response times for crash Caesarean sections- An audit of a Singapore hospital. (2005) Ann Acad Med Singapore 34(10): 606- 610. 15. Kwek, K., Min, L.Y., Tan, K.H,, et al. Crash Caesarean section - decision-to-delivery interval. (2005) Acta Obstet Gynecol Scand 84(9): 914- 915. 16. Pierre, F., Rudigoz, R.C. Emergency Caesarean delivery: is there an ideal decision-to-delivery interval? (2008) J Gynecol Obstet Biol Reprod (Paris) 37(1): 41- 47. 17. Tuffnell, D.J., Wilkinson, K., Beresford, N. Interval between decision and delivery by Caesarean section- are current standards achievable ? An observational case series. (2001) BMJ 322(7298): 1330- 1333. 18. Sayegh, I., Dupuis, O., Clement, H.J., et al. Evaluating the decision to delivery interval in emergency Caesarean sections. (2004) Eur J Obstet Gynecol Reprod Biol 116(1): 28- 33. 19. Livermore, L.J., Cochrane, R.M. Decision to delivery interval: a retrospective study of 1000 emergency Caesarean sections. (2006) J Obstet Gynecol 26(4): 307- 310. 20. Cerbinskaite, A., Malone, S., McDermott, et al. 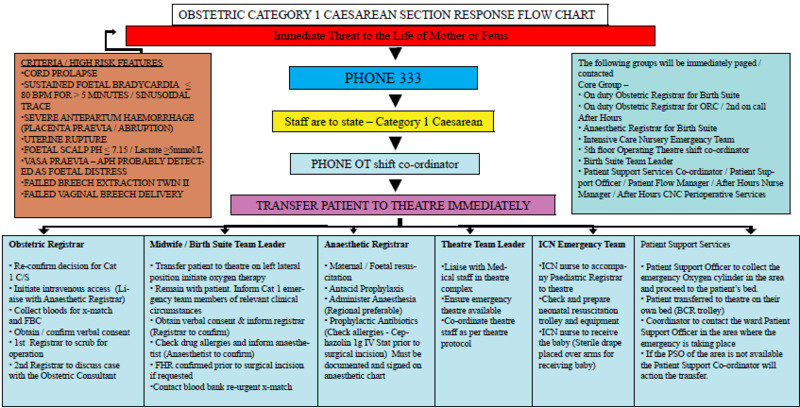 Emergency Caesarean section: Influences on the decision-to-delivery interval. (2011) J Pregnancy 640379. 21. Cruse, P.J., Foord, R. A five-year prospective study of 23,649 surgical wounds. (1973) Arch Surg 107(2): 206- 210. 22. Li, L., Wen, J., Wang, I., et al. Is routine indwelling catherisation of the bladder for Caesarean section necessary? A systematic review. (2011) BJOG 118(4): 400- 409. 23. Kinsella, S.M., Walton, B., Sashidharan, R., et al. Category-1 Caesarean section: a survey of anaesthetic and peri-operative management in the UK. (2010) Anaesthesia 65(4): 362- 368. 24. Beckmann, M., Calderbank, S. Mode of anaesthetic for category 1 caesarean sections and neonatal outcomes. (2012) Aust N Z J Obstet Gynaecol 52(4): 316- 320. 25. Pearson, G.A., Kelly, B., Russell, R., et al. Target decision to delivery intervals for emergency caesarean section based on neonatal outcomes and three year follow-up. (2011) Eur J Obstet Gynecol Reprod Biol 159(2): 276- 281. 26. Kinsella, S.M., Girgirah, K., Scrutton, M.J. Rapid sequence spinal anaesthesia for category-1 urgency Caesarean section: a case series. (2010) Anaesthesia 65(7): 664- 669. 27. Siassakos, D., Hasafa, Z., Sibanda, T., et al. Retrospective cohort study of diagnosis-delivery interval with umbilical cord prolapse: the effect of team training. (2009) BJOG 116(8): 1089- 1096.